Use glass paints on an ivy bowl to make a cheerful pumpkin ivy bowl; perfect as a seasonal candy dish or decorative candle holder for Halloween. Clean the ivy bowl very well, with rubbing alcohol if you have it, to remove any grease or fingerprints and improve adhesion. Draw a few pumpkin face designs on paper until you draw one that you like. Simple lines and shapes are usually the most effective. Reproduce your chosen facial design on the ivy bowl with leading paint. Be sure to read the instructions of the bottle – usually you should not shake the bottle, to avoid bubbles, and you will need to allow it to dry for several hours. Once the facial outline is dry, fill in the eyes and mouth with yellow glass paint, applying the paint with a toothpick. Be sure to spread the paint out to touch all areas of the surrounding lead outline. Paint the remainder of the ivy bowl with orange glass paint, up to the neck of the bowl. Paint a thin orange line around the lip of the bowl. Let the paint dry. Although most glass paint will provide a permanent finish with air drying, you can also bake the glass in a 300 degree oven for 30 minutes to harden the paint for extra durability. Add a ribbon around the neck of the pumpkin ivy bowl. 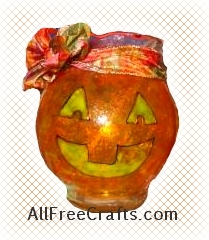 Add a votive candle, or a battery-operated tea light, if you’re using the bowl as a candle, or fill with Halloween candy.